Kick-off is tomorrow night with Wake Forest (23) taking on Baylor. The big weekend match-up Alabama (24) vs. Clemson (9), but for the the most part, it's an easy weekend for the ranked teams unless some gets Appalachian State'd. Who you got? Like you really need the excuse. Aggies over Colorado - whoop! Texas Tech humiliating Texas right now - WHOOP! Woohoo! Great win by my Dawgs, we had more yards, more time of possession and were equal in first downs.... Wait. What's that? 4 turnovers! 2 missed chip shot field goals! An interception nullified by a penalty! A dubious first half onside kick! Sigh, good luck the rest of the way Gators. Well, I do believe we have a play for the month of November already after only one day. You're telling me. Fresno lost to Louisiana Tech this week. Gah! 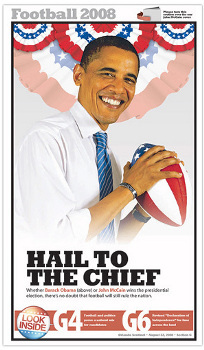 Obama sez: "I think it is about time that we had playoffs in college football." Now that's change I can believe in! He has a better chance with the universal health care program. That's the best idea I've heard from either candidate. Cast my ballot early, though, so he should have said it sooner. What big games are coming up this week? Last week's Texas vs. Tech match-up was all the clash of the titans I could have wanted. My wife and I are going with a mashed up group of Bammer and LSU fans to Baton Rouge this weekend. Why I've decided to spend my weekend hip-deep in Bama fans the week they've slid into the BCS #1 slot is a question that I'll never satisfactorily answer. I intend to drink heavily and eat as much cajun food as possible just to cope. Seriously. Worst football season ever. While there is no god, I'm convinced there's some unholy demon out there granting wishes and he's been discovered by this guy who is using it to fulfill his every desire (Bama on top, Auburn and Tennessee in the sh*tter, Famous on the interwebs). Going to the UF-Citadel game this weekend up in Gainesville. Well, I'm going to the tech game on Saturday. Being a Dawg fan I might be more sensitive to it than others, but I find the Gator Chomp one of the most obnoxious things in all of sports, way worse than the the Seminole tommahawk. Says the guy whose whole team rushed the field after one touchdown last year. edit: Oh and "Terrible" towel gimmicks, noise stick gimmicks, and those stupid horns people blow at soccer matches are far far worse if we are talking all of sports. Yeah, rushing the field was not great, but was an aberration. And when I say all of sports, I mean the only two sports that matter, college football and basketball. To the Gator's credit they have been able to do lots of chomps during the last few years for both sports. Why is there no discussion about Tech v. OU? I expected at least 3 posts from legion about how Tech will win. No point in discussing the obvious/inevitable? I'm just hoping for an iconic image in the victory that I can use against you. And all is at peace. Ahhhh. I'd settle for more Erin Andrews. Oh Erin Andrews, I will never forget you saying "Chase Daniels on the sidelines, obviously pouting" over the PA system in last years Big XII championship game. Ahhh. Oh and I'm only giving OU a 40% chance of winning. Yes its at home, but our run game has been...questionable at times and our secondary has had some big blown coverages.